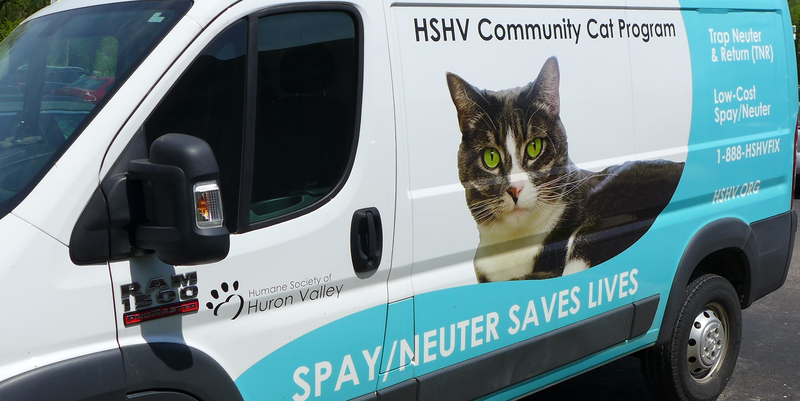 HSHV’s Trap, Neuter, Vaccinate and Return Program aims to reduce the overpopulation of free roaming community cats while supporting a higher quality of life and reducing unnecessary euthanasia of cats. What is TNVR or TNR? Trap, Neuter, Vaccinate and Return, also known as TNVR, is a program sterilizing free roaming community cats and returning them to their habitat. All the cats in a colony are humanely trapped in live traps and brought to HSHV’s clinic. Trapping can be performed by a colony caretaker, volunteers or staff. Once the cats are at HSHV, they are sterilized, vaccinated against rabies, given a left ear tip, and medicine to aid in the post-surgical healing process. After sterilization, the cat recuperates at HSHV overnight. Cats are then returned to their original habitat and released. Colony caretakers continue to provide food, water, and shelter, as well as monitor the health of the colony. TNVR is the only method proven to be humane and effective at controlling outdoor cat population growth. The goal of any community cat management program is to maximize the quality of life for the cats, to eliminate the existing colony over time, and to elevate the worth of community cats, and cats in general, through education and awareness. How can I use the TNVR program? Cats can be brought to HSHV’s clinic Monday through Wednesday 9 am to 6 pm, Thursday before 12 pm for check-in; no appointment needed. Free roaming community cats must arrive in a live trap, one cat per trap—no carriers. Please have live trap covered with a sheet or towel to reduce stress. This is for the safety of our staff as well as the cat. If a bite occurs during the cat’s stay, HSHV will follow the Washtenaw County’s public health rabies protocol, which involves a 10-day quarantine. If you trap a cat during our closed hours, please move the trap to a quiet location, keep it covered with a sheet or towel, and bring the cat to HSHV’s clinic as soon as we open. Upon arrival to the clinic, you will be asked to complete a waiver, and payment will be due at this time. What types of cats are eligible for TNVR? Free roaming cats coming through TNVR should be cats living outdoors full-time, who require being live-trapped because they cannot be handled. Social/friendly cats should go through our regular outpatient veterinary clinic. How much does TNVR cost? If you are in Washtenaw County or Plymouth, TNVR is only $20 per cat. If you reside outside the area, you can still use our TNVR program for $75 per cat. If I don't have a live trap, what can I do? Live traps are available for rental at HSHV for $75 each, with $65 refunded to you when you return the trap. Trap rentals are only for cats coming through our TNVR program. Or you can purchase a Tomahawk Live trap here. I have a large colony and am unable to trap on my own. Can anyone help me? Yes, HSHV has volunteers and staff trained to help with large-scale trappings. Please contact our Community Cat Coordinator at tnr@hshv.org or 734-661-3523. What about shelters? Winter is coming. Will my cats survive? Cats have been surviving outdoors for thousands of years, and you can help them year-round by creating outdoor shelters. Here’s how. HSHV offers a free class for those interested in being an advocate for feral cats. You will learn how TNVR helps reduce the number of free roaming cats, lowers stray intake and euthanasia and creates better, less hostile environments for our community cats. You’ll also learn how you can help — and we need you! TNVR involves trapping all of the outdoor, free roaming cats in a colony, getting them sterilized, vaccinated for rabies, and ear tipped on their left ear for identification, then returning the cats to their territory. A caretaker continues to provide food and shelter and monitors for any newcomers or other problems. Please contact our Community Cat Coordinator at (734) 661-3523 or email tnr@hshv.org.